We’ve got our hands on the FULL-freakin’ content listing – and updated cover artwork – planned for the 2017 WWE DVD on SETH ROLLINS! 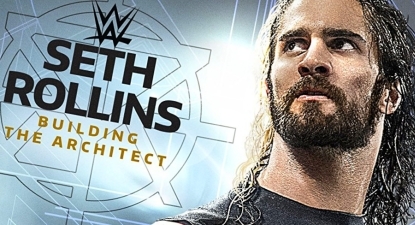 WrestlingDVDNetwork.com can reveal that “Seth Rollins: Building The Architect” will feature a compilation of 21 of Seth’s best matches and moments spanning his career in FCW, NXT, and WWE — plus an exclusive interview with “The Man” himself between every one of them! Seth Rollins’ 3-disc DVD set is incoming for release worldwide, beginning this May to both fans in the United States and the United Kingdom, the same month WrestleMania 33 hits stores. – UK/Europe: May 29th. Pre-order the new Seth Rollins DVD here on Amazon.co.uk. – USA: May 30th. Pre-order the Seth (freakin’!) Rollins DVD right now here on Amazon.com. Nice list. Wish his MITB 2014 where he won the MITB briefcase and his back to back NOC 2015 matches vs Cena & Sting were included. While I like that a lot of tv stuff are here as ppv content are typically released elsewhere, part of me does feel like there’s too much Shield stuff on a Seth Rollins focused dvd. Just my opinion. Lol, they should have included all the matches where he’s injured people and sent a free copy to Bret Hart. If you sick of explaining it then don’t comment. I’m still allowed to make a point without an explanation. If you can’t respect people’s opinions then don’t comment. They’re entitled to whinge and complain as they’re the ones who are purchasing the item. Surely they’re not purchasing it? Lol. Still waiting on a response to this Bruno … lol! This set doesn’t look like anything special. HUGE load of repeats; what a waste. Will avoid this one. I might pick this up in a future sale. Lots of matches I already have in my collection, but also some FCW matches I haven’t seen. If people want some matches with Rollins, that they probably haven’t seen, buy some of the Tyler Black DVDs that Ring of Honor has released. Rollins had a pretty good run as ROH World Champion before he signed with WWE. Wonder what the WM31 ending will be. Anyways, lots of matches are repeats, but I’ll wait for a price drop to pick this up. Sick set I am looking forward to potentially getting it. I love Rollins. Great competitor. Glad to see FCW matches on here. I don’t understand when I am going to buy a DVD it will be of matches I’ve never seen. Why would I waste my money for stuff that I get on the WWE network and I already paid for. All of his best matches happened on either PPV, Raw or Smackdown. And all of those matches are on the Network. So I’m curious to know what matches you were expecting on this release. maybe you don’t but others do. that’s why there are dvd and bluray releases for Netflix shows. some people want to OWN a physical copy of it for various reasons (from the artwork to the unlimited accessibility. No Sting match from NIC 2015..a match against one of the biggest icons not present on first big release for Seth!? Great match listing. I can’t wait to turn on my 50 inch HD tv, throw this release in my HD blu-ray player and watch these great matches in low crappy blurry standard definition because they can’t keep up with technology in 2017 and release all of their media on blu-ray. Wouldn’t it get up scaled? It would but its better than a blurry picture. Even the colors and lights on the entrance ramp in the arenas are unwatchable because the colors blur and bleed together. Picture quality is just horrible on DVD. I tried watching a few matches on Best of RAW and SmackDown and I had to turn it off. I would rather just find my favorite matches and watch them on the network. I meant I would hope it would help the picture but the blu- ray player doesn’t help the quality of a DVD. Maybe for regular movies but not for wrestling. I think the lights they use in the arenas are meant to look good on their HD cameras. But comes across blurry. That’s weird. My ps3 upscales dvds and they look great. In fact I have thd old wrestlemania collection and it looks perfectly fine. That’s because the old WrestleManias weren’t taped in HD. There wouldn’t be any big noticable dfference. When you watch a DVD that was taped in HD(anything 2008 and on) on an HDTV or 4KTV, the difference is very noticable. So if its taped in hd then you watch that same content on dvd..its noticeable? Phew lucky me..i usually stick to everything pre 2007. I stopped watching wwe in 2007. SD content upscaled looks better however HD content scaled down to SD (basically DVD) looks like crap. Imagine HD can have a maximum bitrate of about 40mbps. Usually WWE Blu-rays are about 20-25mbps. DVD can only output max 9.8mbps, which cause crazy amount of compression which is why HD content come out blurry and not so good on DVD. Its not the way it should be seen. HD on the Network is miles better than DVD quality. We are already into 4k media and UHD…while WWE is still stuck releasing 1080i content downscaled to 480p. They always been behind in media formats so doesn’t surprise me and I don’t think we will ever see WWE in 4K anytime soon. well it’s noticable in the sense that each versions, no matter if it’s the Network, dvd or the bluray will end up just being upscaled. that’s big difference to the upscaled content/content in 720p/1080p comparison. Yeah LP1 is correct. Any DVD released prior to WWE filming in HD looks better when you watch it on a blu- ray player however new DVD releases in the HD era look blurry IMO on a blu- ray player and doesn’t upscale well. I never watched on a Playstation so I’m not sure how well that translates. Then we must all have that same screwed up TV. The difference between shows taped in SD and HD are very noticable. you know who should get the most blame regarding this: “us” – as in the people buying (or in this case not buying) the releases. if WWE blurays were bigger sellers every release would still get the bluray treatment. BTW since we are getting Rollins and Owens does that mean we are finally getting Reigns next year? I know most people on this site would groan at the thought of that but I wouldn’t mind seeing him get a DVD. I am all for someone who gets the full weight of the WWE machine even if that person is someone I am mostly neutral on. Reigns has a dvd already. Its with the Ultimate Fan Pack Action Fig…..oh wait. My bad. Don’t mind a Reigns set at all. He closed out two WMs, one where he won the world title from HHH. But I think some other talents deserve a set prior to him getting one. Documentaries on veterans like Rock & Kane. With them going into the HOF this year, docs on Kurt Angle, Rick Rude, RnR Express would be very fitting. I suspect once he retires & enters the HOF, Taker will get the long awaited doc set. Depending on when that happens, they could maybe get a Reigns set in there somewhere. Seriously, though, I don’t really care about Rollins but the fact that the full content listing is here (and Owens shouldn’t be far behind since we’ve already gotten one match) means the lineup for the second half of 2017 should finally at long last be ready to be revealed very soon. That’s what I really care about, not Rollins and Owens and other current guys. This is a solid content listing for those that do though.